Clarke, A.H. 1985. The tribe Alasmidontini (Unionidae: Anodontinae), Part II: Lasmigona and Simpsonaias. Smithsonian Contributions to Zoology (399): iii + 75 pp. Lasmigona (Lasmigona) complanata alabamensis Clarke, 1985. Clarke, 1985, Smithson. Contrib. Zool. : 36, fig. 10. 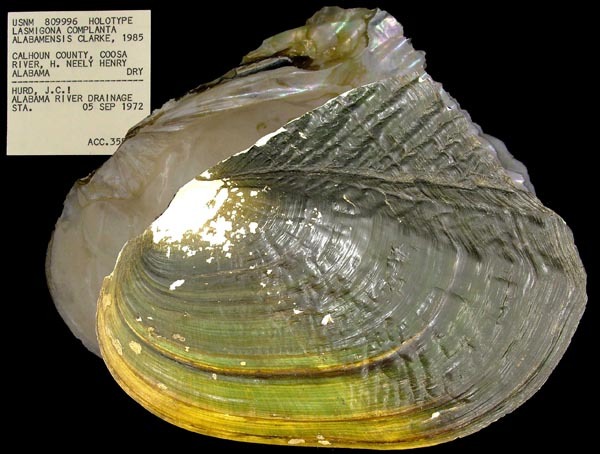 Type(s): HOLOTYPE USNM_809996, Coosa River, (Alabama River Dr.), H. Neely Henry Lake, Calhoun Co., Alabama. ‘Lea’ Clarke, 1985, Smithson. Contrib. Zool. : l51. Lasmigona (Alasminota) holstonia (Lea, 1838). — Clarke (1985: 3). Lasmigona (Platynaias) compressa (Lea, 1829). — Clarke (1985: 40). Lasmigona (Platynaias) decorata (Lea, 1852). — Clarke (1985: 57). Lasmigona (Platynaias) subviridis (Conrad, 1835). — Clarke (1985: 51). Lasmigona (s.s.) complanata alabamensis Clarke, 1985. — Clarke (1985: 36). Lasmigona (s.s.) complanata complanata (Barnes, 1823). — Clarke (1985: 25). Lasmigona (s.s.) costata (Rafinesque, 1820). — Clarke (1985: 12). Simpsonaias ambigua (Say, 1825). — Clarke (1985: 61).